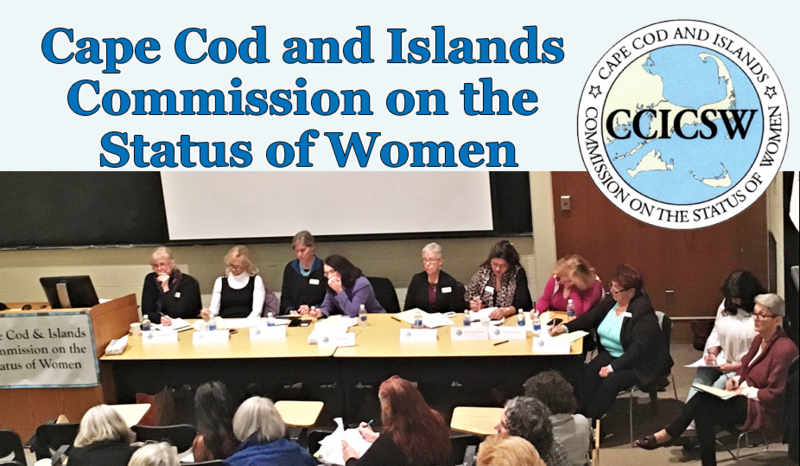 The Cape Cod and Islands Commission on the Status of Women (CCICSW) is comprised of thirteen commissioners. The purpose of the CCICSW is to advance women toward full equality and to promote opportunities for all women. Created by the legislature in 2009, the commission draws on the experience of women and their families from diverse backgrounds throughout Barnstable, Dukes and Nantucket Counties, and reports its findings to the Massachusetts Commission on the Status of Women annually. In addition, the CCICSW’s duties include: studying, reviewing and reporting on the status of women on the Cape and Islands, promoting and facilitating collaboration among local women’s organizations, recommending policies that benefit women to agencies, officers of the state and local government and holding fact-finding hearings and other public forums as it may deem necessary. Applications are welcome from individuals residing in Barnstable, Dukes, or Nantucket counties with experience in issues pertaining to women. To be considered for appointment to the CCICSW, please complete all three sections of the application and email the responses to both CCICSW and MCSW by November 30, 2016. The CCICSW meets on the second Wednesday of the month, except in July and August from 5:00-7:00 PM in varying locations across Cape Cod. Additional public hearings and meetings are held as necessary on Cape Cod, Martha’s Vineyard and Nantucket. The CCICSW meets ten times a year. Attendance is expected on a regular basis; more than four unexcused absences in a full year will be grounds for discussion of the commissioner's intent to participate. Commissioners are expected to serve on CCICSW committees, participate in their local community activities that support the CCICSW’s outreach and help monitor local decisions that affect the well-being of women. Once appointed, all commissioners are required to complete both the online Open Meeting Law and Conflict of Interest training within two weeks after being sworn in and submit a printed certificate to the CCICSW secretary at their first meeting after being appointed and sworn in. Commissioners may not attend meetings until these documents are submitted.